It started off much cooler than the last couple of weeks at only 17 degrees as we returned to the Forks of the Credit. Once again we parked near Dominion Road, this time in search of an old tramway associated with two of the quarries around the Forks of the Credit. Research suggested that it may have passed across the CVR tracks and reached between Quarry no. 2 on the Cox Property and the Big Hill Quarry on the east side of Dominion Road. 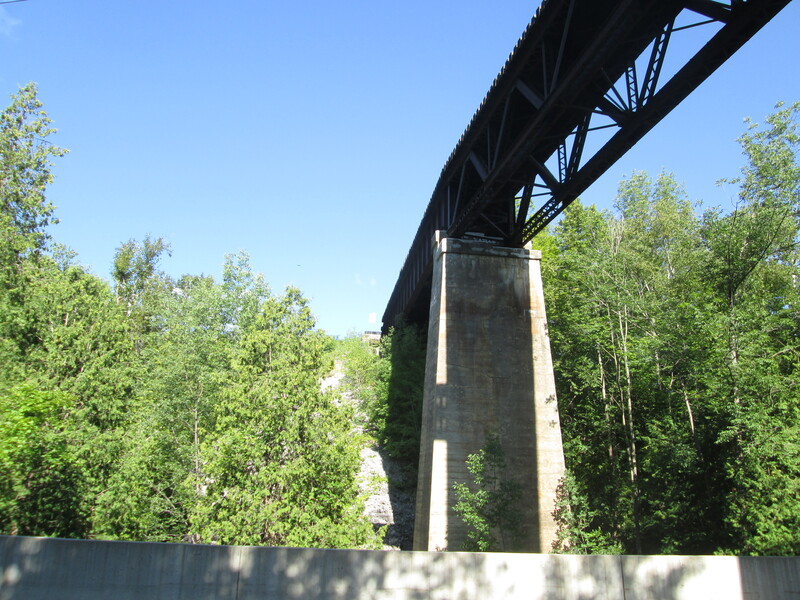 We set off along Forks of the Credit road and passed under the rail bridge. As featured in the Devil’s Pulpit post, this bridge was the longest curved wooden trestle bridge in Ontario at the time of it’s construction. Safety concerns led to it being filled in to form a more stable berm. Of the 1,146 feet of trestle only the three sections crossing the road and river were left open. The picture below looks up at the 85 foot high bridge and north to the berm it rests upon. Inside this berm hides the original wooden trestle that was basically buried alive. Special rail cars were loaded with gravel excavated locally and pulled out onto the trestle. The gravel would pour through the trestle until it filled up the space to the rails above making this what is known as a fill trestle. 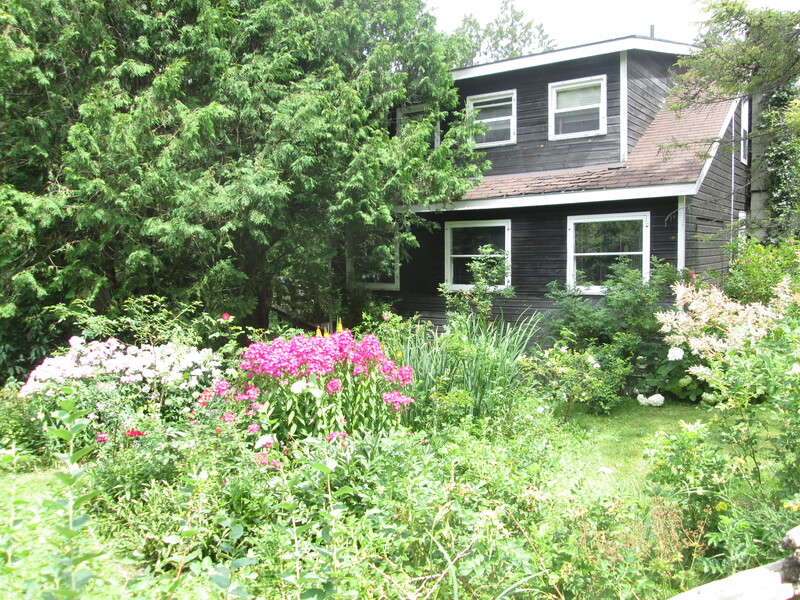 In the valley stands one of the original 33 homes from the village of Forks of the Credit. Not much remains of the little village that grew up around the quarry industry. 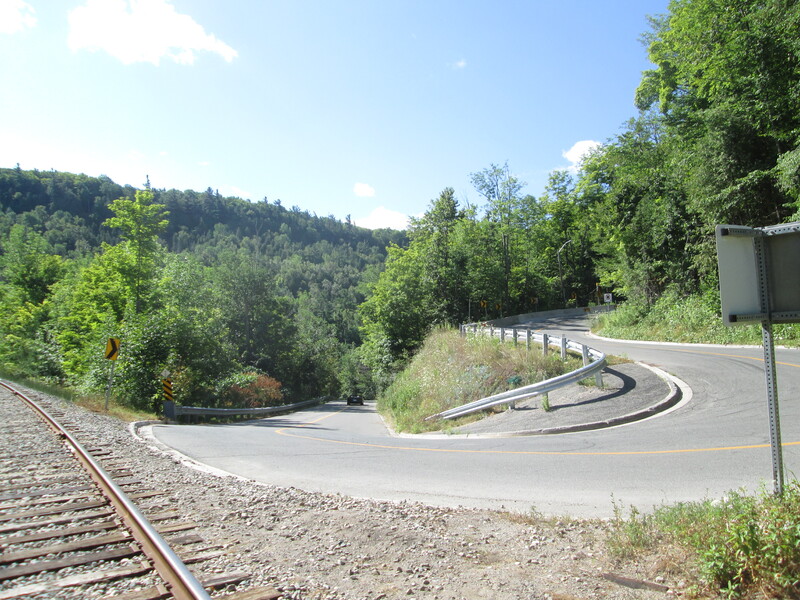 The first bridge over the Credit River was replaced with a newer one near the bottom of the hairpin curve. 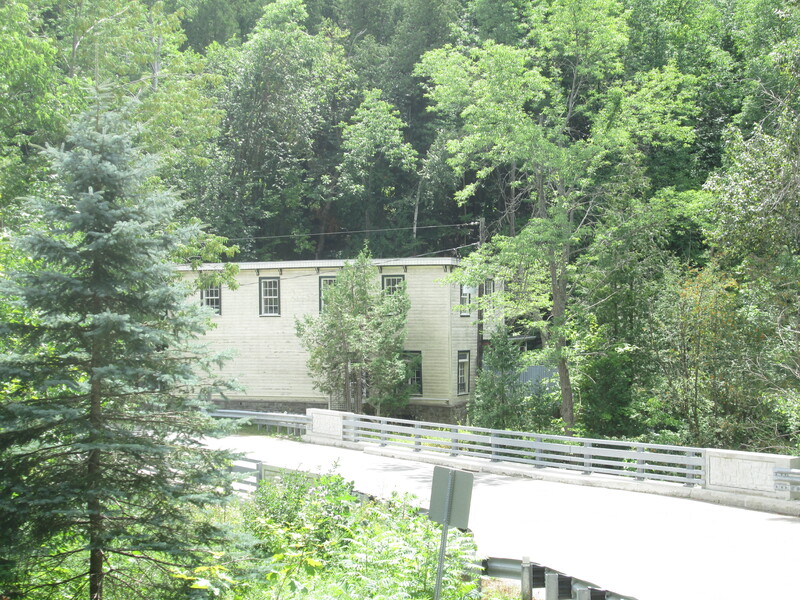 Near this second bridge over the Credit stands the former Post Office and General Store. The Credit Valley Railway station stood in the small open space near the hairpin turn. On the crest of the next curve stands the Cox house after which this piece of property is named. 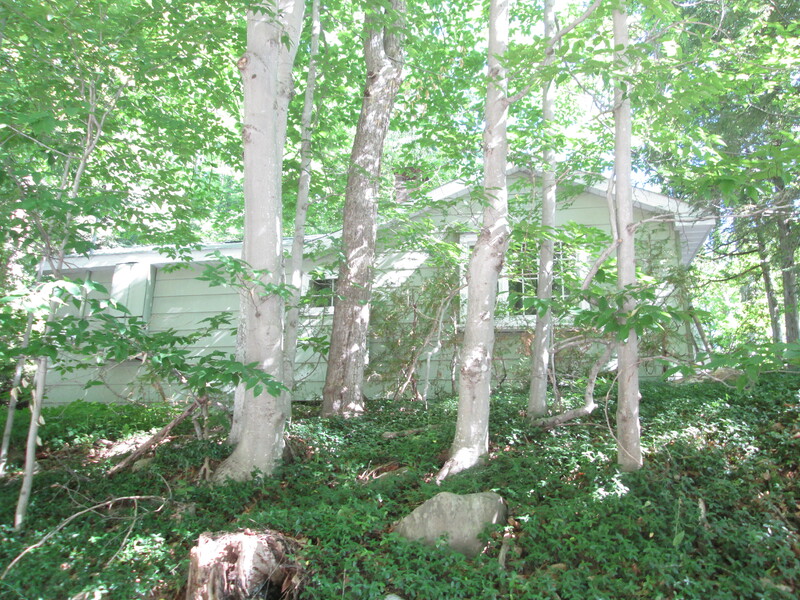 As far as the township is concerned this is also part of the Willoughby Property which features the unique and barely accessible Stonecutter’s Dam. While the Willoughby Property has several maintained trails the Cox Property is being managed with a “hands off” approach. 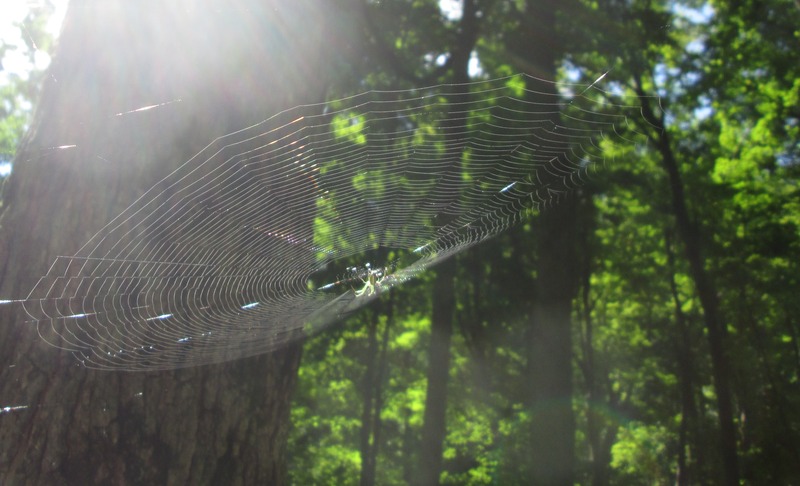 The spider in the centre of this web is quite possibly an orchard orb weaver spider although there are several different varieties. She was sitting out taking in the sunshine and watching for breakfast to come along. Just north of the former railway station was a brick manufacturing plant that we weren’t able to locate in the heavy undergrowth. We got onto a yellow marked trail that eventually led us to the Caledon Ski Club. The Toronto Ski Club was formed in 1924 near Richmond Hill and by 1930 had 2000 members. They started expansion including in the Collingwood and Caledon areas. In 1934 they hosted the Ontario Ski championships with some of the racing taking place in Caledon. 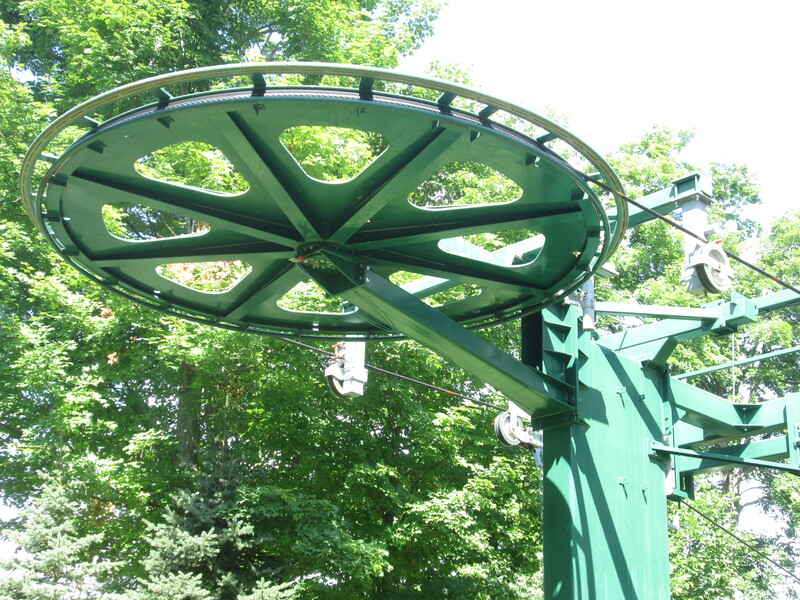 The picture below shows the top of one of the ski lifts while the cover photo shows the bottom of the lift. Svend Jepson had won a silver medal for Denmark in gymnastics at the Olympics before emigrating to Canada. 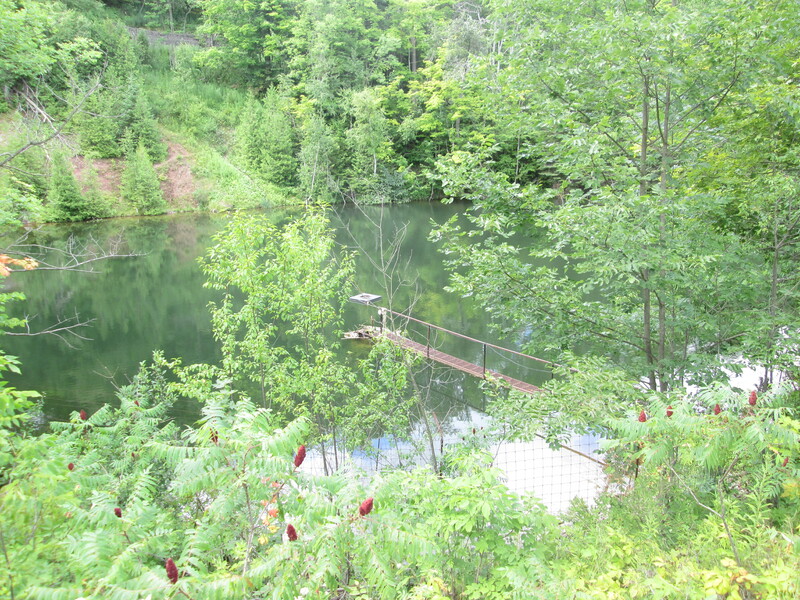 He bought a property on the top of the escarpment overlooking the Forks of the Credit. He cut a ski run down the side of the hill and by the 1930’s he was running a sort of ski resort on his property. People would come to Inglewood by train where he would pick them up and bring them to his home. He charged $2 for a bed and breakfast and the use of his 600 foot ski runs. By the late 1930’s the Toronto Ski Club was moving it’s competitive racing to Collingwood and the runs in Caledon reverted to their natural state. In 1957 Jepson’s daughter Helen bought the property next door. 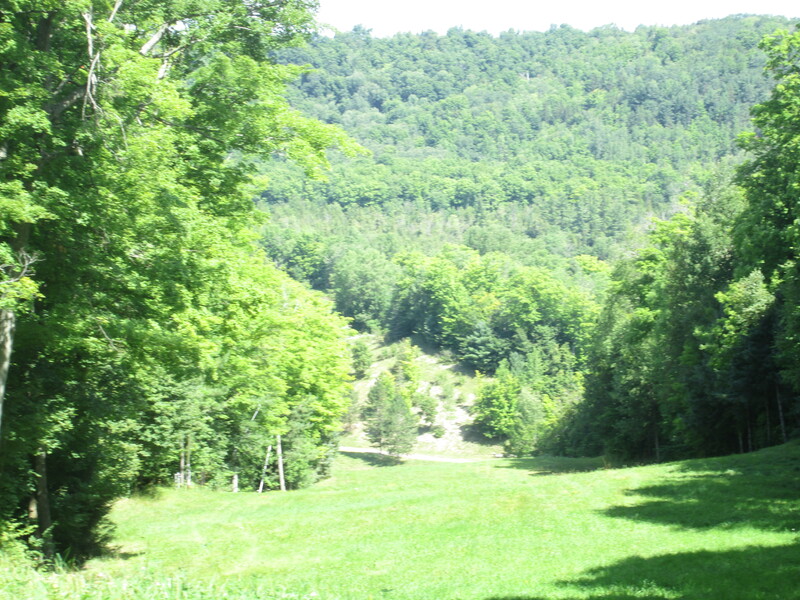 Her and her husband used the two properties to start the Caledon Ski Club. In December 1961 a new location was purchased on lot 11 where the slopes were twice as tall and there was challenging rocks to ski around. A roadway was cleared to the site and a parking lot was cleared. Soon some runs were cut and the first nylon tow rope was installed. Caledon Ski Club now has 23 runs and 8 lifts. The picture below shows one of the ponds where water is collected for use in snow making for the following season. From the Dominion Street bridge the actual forks of the Credit can be seen where the East Branch meets up with the main Credit River. We walked up Dominion Road to Brimstone were a small community of quarry workers lived. Just before the town is a place where a mudslide in 2005 closed part of the roadway. A series of concrete blocks has been installed to prevent further damage but a clear strip of hillside reveals the site of the landslide. Near the village of Brimstone the two inch cable of the aerial tramway used to cross the valley. The picture below shows the actual Forks of the Credit. 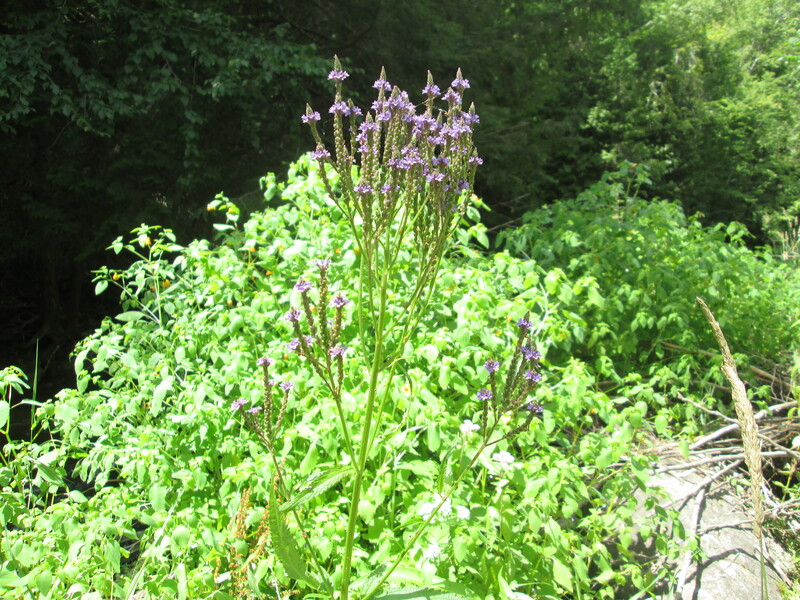 Along the east Credit river patches of Blue Vervain grow. These slender purple spikes blossom from the bottom to the top. The plant has been used for centuries as a pain reliever and stimulant. It is also known to relieve headache and rheumatism. The ski tramways we found were not the aerial tramways were were looking for but not being found isn’t the same as not being there. Some places need to be explored in the spring or fall when there is no vegetation to hide the relics. Or, perhaps someone who has been there will read this and comment. 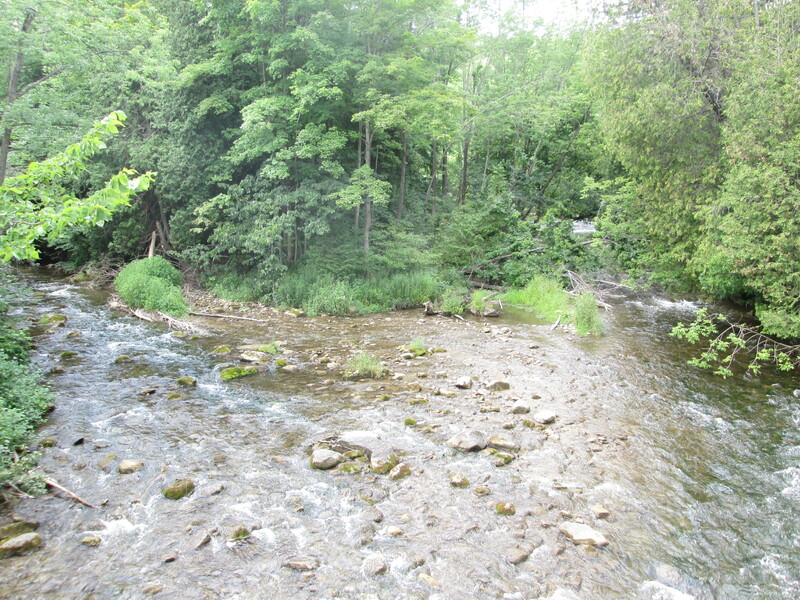 This entry was posted in Credit River and tagged Aerial Tramway, Caledon Ski Club, Cox Property, Credit Valley Railroad, Forks of the Credit on August 4, 2015 by hikingthegta.